Offering affordable accommodation in Asaba, Sweet Spirit Hotel and Resorts is situated in a very scenic area at Plot 222 Mardezok Street Okpanam Asaba, Delta State. This hotel is appropriate for business travelers. The hotel rooms feature en-suite bathrooms, work desks, telephones, refrigerators and TVs with satellite services. 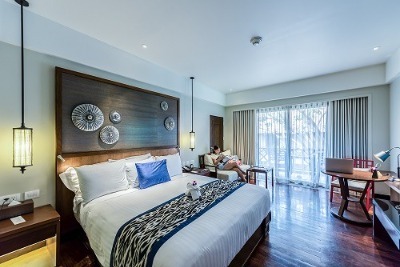 The room can be categorized into deluxe and superior suites. Breakfast is served daily. Other meals is served in the restaurant, there is also an option of room service. The bar is well stocked with varieties of beverages. Guests can enjoy afternoons at the pool area, either swimming or relaxing by the poolside. Drinks can also be ordered and enjoyed at the hotel bar or beside the pool. A modern gym at the hotel caters to fitness enthusiast who can partake in a various fitness exercise here. Laundry, car hire, housekeeping, airport pickup, beauty service and concierge are additional services available on request. Ample parking space and security is guaranteed. Sweet Spirit Hotel and Resorts is a top-class hotel in Asaba, Delta. My stay at the hotel was good. I was okay with the ambiance and aura of the place. It's unfortunate I had to truncate my stay due to an emergency that came up. I hope to be back though and perhaps stay longer. I'm giving you a good review even though I did not particularly like every experience at your hotel. For example, the air condition in the room I and my husband used was steadily dripping water. My husband's trouser was drenched as a result. Secondly, we found the manager to be somewhat rude to us. It was not exactly pleasant but we pardon all your shortcomings since we are business people ourselves and are very discerning. I want to just say you're severely under utilizing your hotel's potential, besides the failings, we had such an amazing stay. Have nice pictures of Sweet Spirit Hotel and Resorts ?